Movement behaviour of ungulates within a mid-sized arid rangeland reservation has implications for both conservation management and tourism. 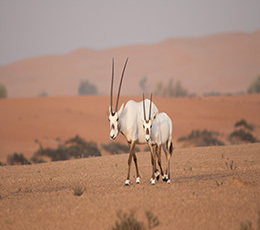 In this qualitative study, one male and one female Arabian oryx were tracked each 15 minutes for eight months using GPS collars in the 226 km2 Dubai Desert Conservation Reserve. Results were consistent with wild animals of the species for movement response to time of day, temperature, and rainfall. However, the oryx routinely used only 4.5% of their available range, despite having much larger ranges in wild populations. During summer months, the oryx actively sought drinking water on an almost daily basis, but utilized shade only opportunistically. Results were consistent with domesticated ungulates for toleration of anthropogenic proximity in exchange for artificial food and water, but avoidance of the DDCR boundary fence. An edge of 0.5 -1.5 km from the fence was breached only occasionally at night, and was unrelated to anthropogenic activity outside the fence. As the edge represents 18-48% of the reserve, carrying capacity could be improved by using artificial feed and water points to encourage animals into this area.